Fat Mama's Tamales: Top Spot for Tamales and Margaritas in Mississippi! 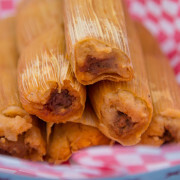 August finds Fat Mama’s Tamales featured on MississippiList.com as the “Top Spot for Tamales and Margaritas in Mississippi“! The article starts with what inspired Fat Mama’s back in the 1980s and goes on to share some highlights from our menu, including our world famous Fat Mama’s Tamales. “Today, Fat Mama’s menu has evolved to one of tamales, boudin, chili, Mexican cornbread, poboys, nachos, and more. Their signature Gringo Pie combines tamales with chili, cheese, onions and jalapenos on top. Their Gringo Casserole is pretty much the same thing, only prepped for a large crowd. Thanks so much to MississippiList.com for stopping by and enjoying Fat Mama’s Tamales with us!